Ratification of the amendment was bitterly contested. 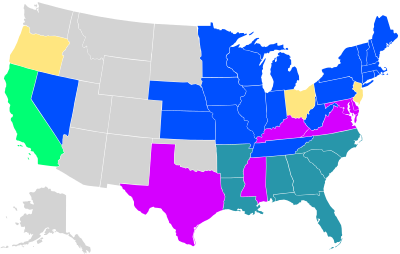 State legislatures in every formerly Confederate state, with the exception of Tennessee, refused to ratify it. This refusal led to the passage of the Reconstruction Acts. Ignoring the existing state governments, military government was imposed until new civil governments were established and the Fourteenth Amendment was ratified. It also prompted Congress to pass a law on March 2, 1867, requiring that a former Confederate state must ratify the Fourteenth Amendment before “said State shall be declared entitled to representation in Congress”. On July 20, 1868, Secretary of State William H. Seward certified that the amendment had become part of the Constitution on July 9, 1868, if withdrawals of ratification by New Jersey and Ohio were ineffective. The following day, Congress adopted and transmitted to the Department of State a concurrent resolution declaring the Fourteenth Amendment to be a part of the Constitution and directing the Secretary of State to promulgate it as such. Both New Jersey and Ohio were named in the congressional resolution as having ratified the amendment. Their inclusion as ratifying states by Congress goes to the merits of rescinding a ratification after it has been affirmed, and of approving a ratification after it has been rejected. It would appear that Congress has determined both have no impact on the ratification process – see Coleman v. Miller. Accordingly, Seward issued an unconditional certificate of ratification, dated July 28, 1868, declaring that the Fourteenth Amendment had been duly ratified by the requisite three-fourths of the states. During the preceding week, two additional states had ratified the amendment, which left no doubt that the amendment had indeed become operational. This entry was posted in HISTORY, POLITICS/DOMESTIC, SOCIETY and tagged 14th Amendment, Birthright Voting by Thinkwing Radio. Bookmark the permalink.